There are times when asking for help is the last thing we want to do. Sometimes the thought of reaching outside yourself and asking for help is too scary. I get this. I denied myself help for a long time because I was afraid of the unknown, what people would think, or how I would change. I wanted to change but that is scary. It's an uphill battle which takes time, patience, a lot of energy, and some deep soul searching. I am not a psychologist yet, but someday I will be. I want to help people understand that our minds are sometimes our biggest foes. 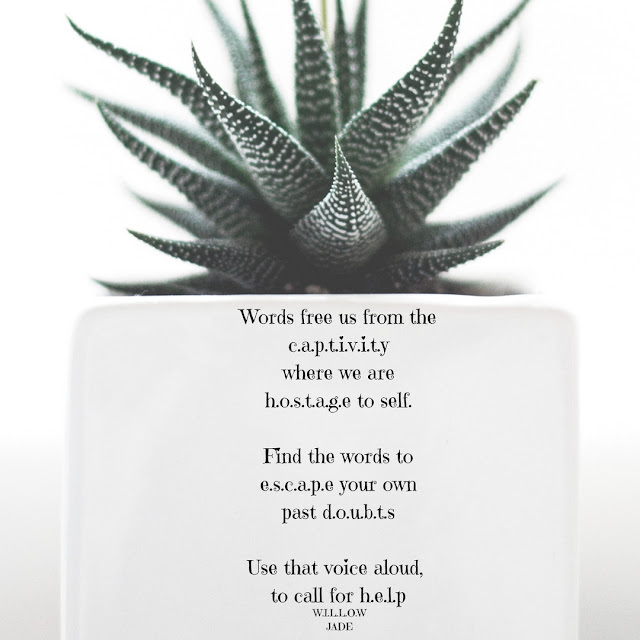 We have been programmed to believe our thoughts and ideas and feel as though we are being held hostage, like a prisoner. One way that I have been able to free myself is through words. Words written down here in Simply Gourmet or in my journals, through poetry (like I share on Thursdays) and words spoken to my friends and family. When I wrote this poem, I was feeling as though, my mind was holding me hostage, again. I knew that I was holding back words, out of fear of hurting or wounding others. At the time, I was unable to express my thoughts. This poem came from that experience. It also forced me to read the words out loud. My expression in the poem was a way for me to ask for help. Help from outside sources that could nudge me along to the path of freedom. Help comes in many forms. From willing friends, family, and partners to professionals. Asking for help is brave and courageous. Freeing our minds can be as simple as pouring your guts out over dinner to your cat.